It never was my intention to take such a long break from blogging but summer holidays took priority over baking and making anything with apples. However apples didn’t disappear entirely from my world over the last few months. 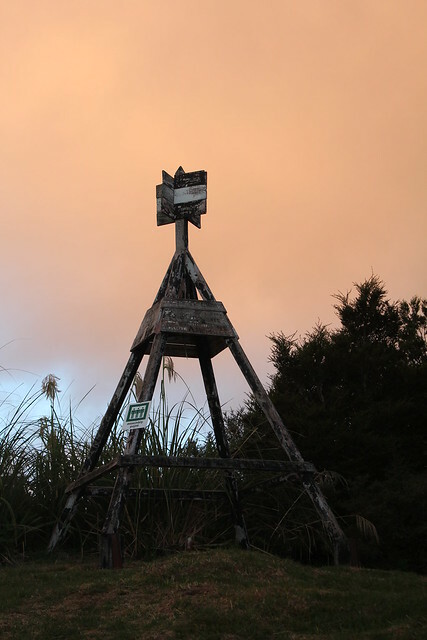 – A road trip to the Wairarapa proved a little dangerous in that I decided I could happily relocate if the lure of Gisborne ever faded (and the chance of that is extremely low). Wairarapa has a strong apple presence and there are many roadside vegetable shops and shacks. We discovered real fruit ice-creams and had one every second day – I chose the frozen yoghurt option and can vouch that the blueberry and the cherry were both so good I’d give up ice-cream for a year just to try them again (well, maybe….). I was surprised to find apples for sale and couldn’t decide if they were last season’s or this extremely early new season apples. Being late late December, I went with them being extremely early new season apples. I wish I had taken a photo but I thought I’d remember the variety and I haven’t. I didn’t try one either – I was side-tracked by the cherries. Another wonderful apple product available in the Wairarapa – both in the orchard shops and the supermarkets is single-variety apple juice. I had sampled a lot of this when in Tasmania so it was a delight to find NZ apple producers had the same great idea. A bottle of Pure Pinehaven Delight Apple Juice made it home. The beauty of having a pantry stuffed full to bursting is that occasionally things get lost behind other things and when looking for something, a treasure (that you weren’t looking for) is found. So we all enjoyed a glass of 100% pure Pinehaven Delight apple juice with our dinner on Valentines Day. – Along the way we visited some lovely second hand shops and gift / homeware shops. There is nothing more enjoyable than poking around a second hand shop crammed to the rafters with treasures waiting to be found. One shop I visited was 10 minutes from closing and as I fossicked around I found a grapefruit spoon (these are high on my radar as we only have two and they are very hard to find). 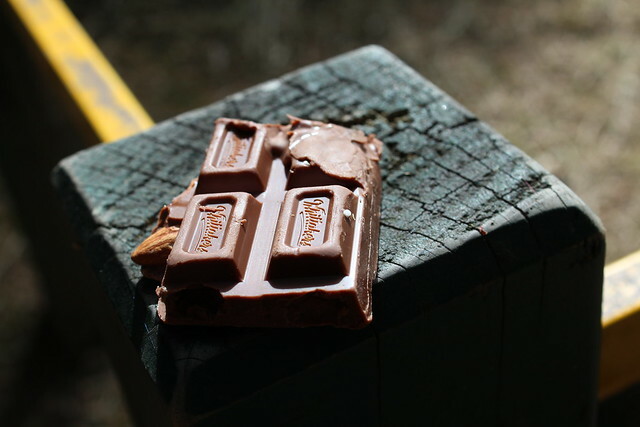 I was embarrassed and bummed when I discovered I had left my wallet in the car several blocks back along the street and I had no change – not even one measly dollar to pay for my treasure. I reluctantly left the spoon behind and slunk out of the shop. But on the up side I found a lovely little trio of apples to join my existing apples. Miss M decided her mother had completely lost her reason when I found a lovely cracked glass “apple” but didn’t buy it because the price tag said it was a pear. I’d seen a pear version in another shop and decided if there was an apple, I’d need it join my collection. However when I did finally find the apple version, it wasn’t very apple looking and with the mislabeling, I convinced myself that it didn’t really know what it was so it stayed on the shelf. 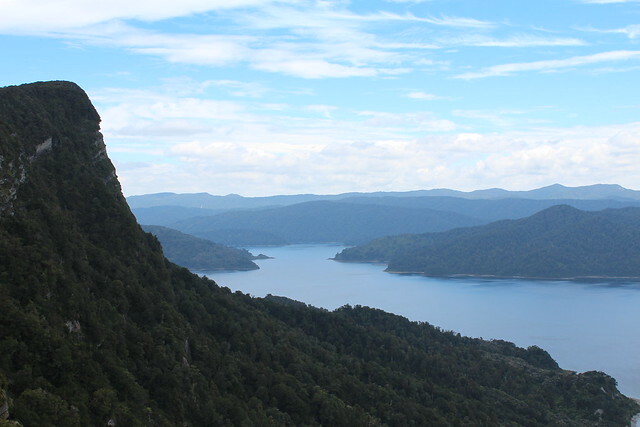 – A separate part of our holiday was a tramp (hike) around one of NZ’s great walks: Lake Waikaremoana. We had organised a large group of friends and family (19 of us aged from 2.5 through to 40 something) and had booked every single hut – some people walk the lake in two days but we took a leisurely six days. Beginning at the Onepoto end, we had the hardest part of the walk first. After days one and two, every single muscle in my legs hurt so much I thought they were going to fall off. 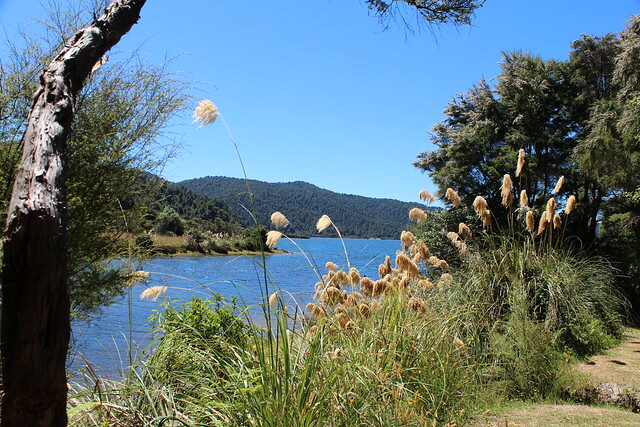 It was a superb six days – tramping (hiking) through beautiful bush listening to the birds while carrying all our needs in a pack on our back is a great way to spend a week of holidays. The clear cold lake was right there beside the walk so we could swim and wash away the grim and sweat of the day as often as we liked. Post walk we had another five days staying in the luxury (we had flushing toilets and showers and hot water from the tap) of Home Bay Motorcamp. This time our group numbered 39 – a great time with friends and family with loads of kids and teenagers to entertain us. – Now it is back home and back to the garden which has grown out of control while I’ve been out enjoying other parts of NZ. The apple trees are laden with fruit, some of the plums have so much fruit the branches are in danger of snapping while others are so scant, there is hardly enough to snack on. The courgettes and zucchini’s have got out of control and I have 5-6 marrows to try and use up. One was sent back to Auckland as my dad loves marrow, we had steamed and lightly sauted marrow rings for dinner (which Miss M LOVED (she was also incredulous that a marrow is just a giant courgette)). Another has been turned into chutney and I am contemplating making some marrow & ginger jam which still leaves me with three marrows………. 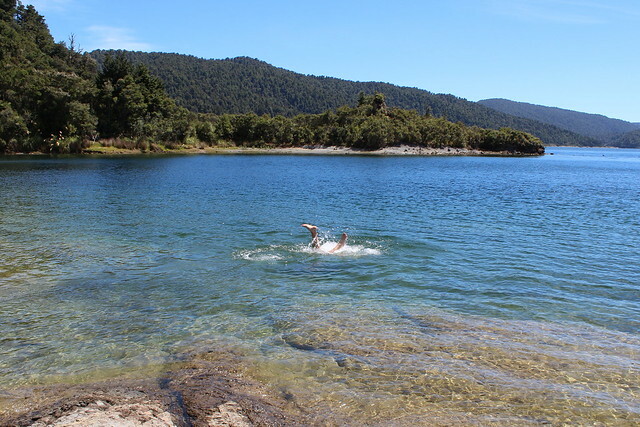 This entry was posted in Gisborne Life and tagged Lake Waikaremoana, NZ Great Walk, Pinehaven Delight, Wairarapa by Jo Dohrman. Bookmark the permalink.